As MAERSK BEAUMONT arrived from No 6 Anchorage at the north end of the Cumbrae, the workboat TORCH laid temporary dan buoys to indicate where each of her anchors should be lowered to the loch bottom. 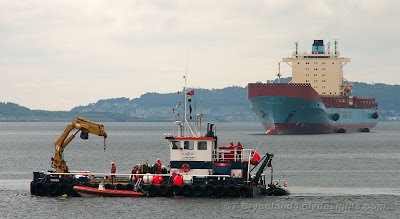 SEALAND PERFORMANCE, although anchored, was being held clear by the tugs while MAERSK BEAUMONT slipped past towards her position. An orange buoy can be seen just ahead of TORCH - that was where she would drop her port anchor. Her starboard anchor would be dropped later, once she had moved across to the east shore a few yards to the position marked by the white buoy visible below her starboard quarter. 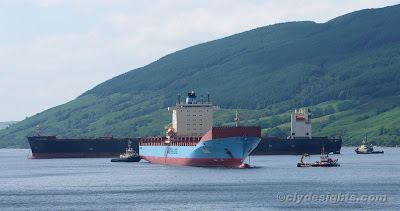 Now nearing position, MAERSK BEAUMONT lowered her port anchor at the designated spot, and then using a combination of thruster power and the tug made fast aft - SVITZER MALLAIG - moved across to lower her starboard anchor.